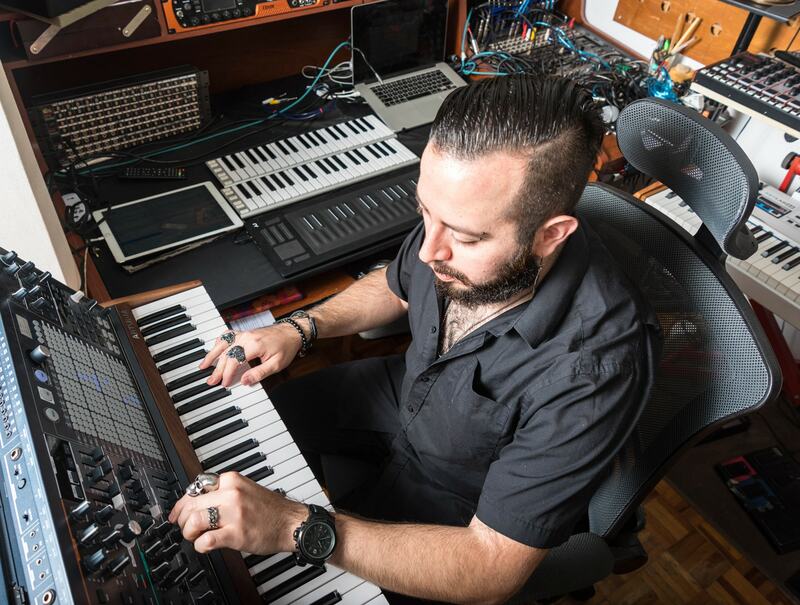 Behind a complex but meticulously organized synth and tech rig is Diego Tejeida, Mexican-born keyboard player whose virtuoso playing has graced every Haken performance since 2008, and every one of their five studio albums. 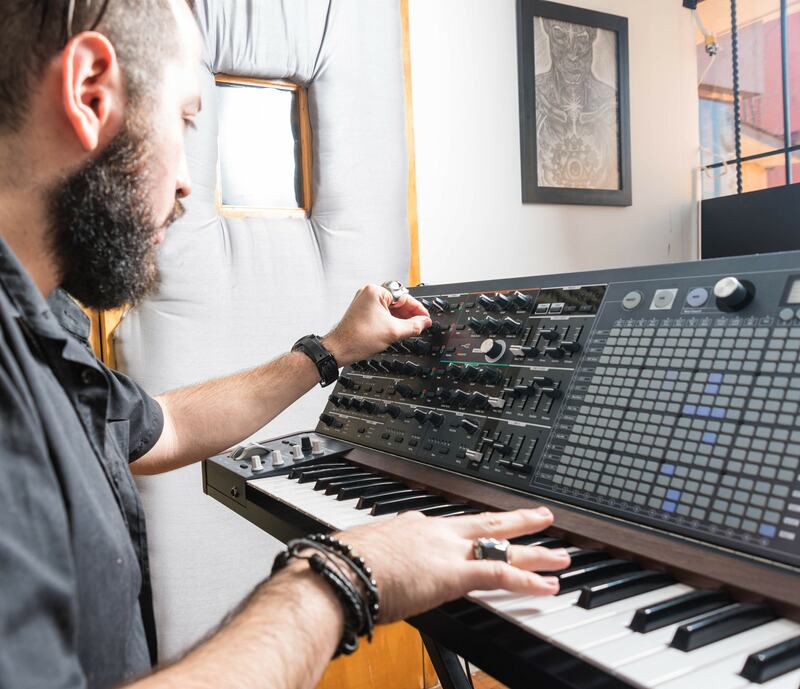 When we noticed that our flagship analog synthesizer MatrixBrute had been added to his live setup, we couldn’t wait to hear how this synth-master would use its unique abilities for progressive metal. 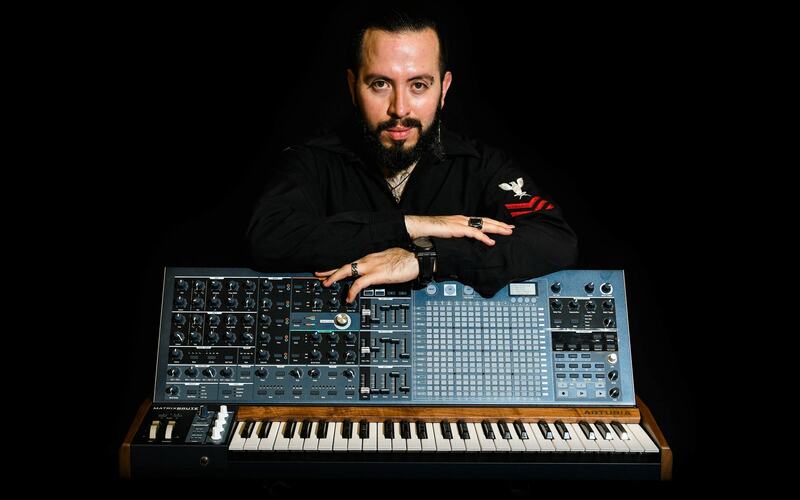 We caught up with Diego to discuss all things synth. I’ve been a musician my whole life. It’s hard to think of what led me to become one since music has been part of my life for as long as I can remember. Tejeida took up piano at age 5, and while he didn’t share the classical ethos of his tutors, that training helped him develop the technique, skills, and theory that he still uses today. Like many an early teen, he discovered the heavier side to music through the likes of Nirvana, Metallica, and Slipknot. Being a pubescent rebel at the time, I came to the conclusion that the piano was never going to be an instrument that I could rock out with, or destroy on stage ala Kurt Cobain. I opted to take guitar lessons, putting the piano aside. As Tejeida discovered more and more bands, he realized that keyboards and synthesizers could open up exciting new sounds for pianists. Listening to the wide variety of sounds that Infected Mushroom, The Prodigy, Aphex Twin, Yes, Pink Floyd, and Dream Theater could create using keys excited him. 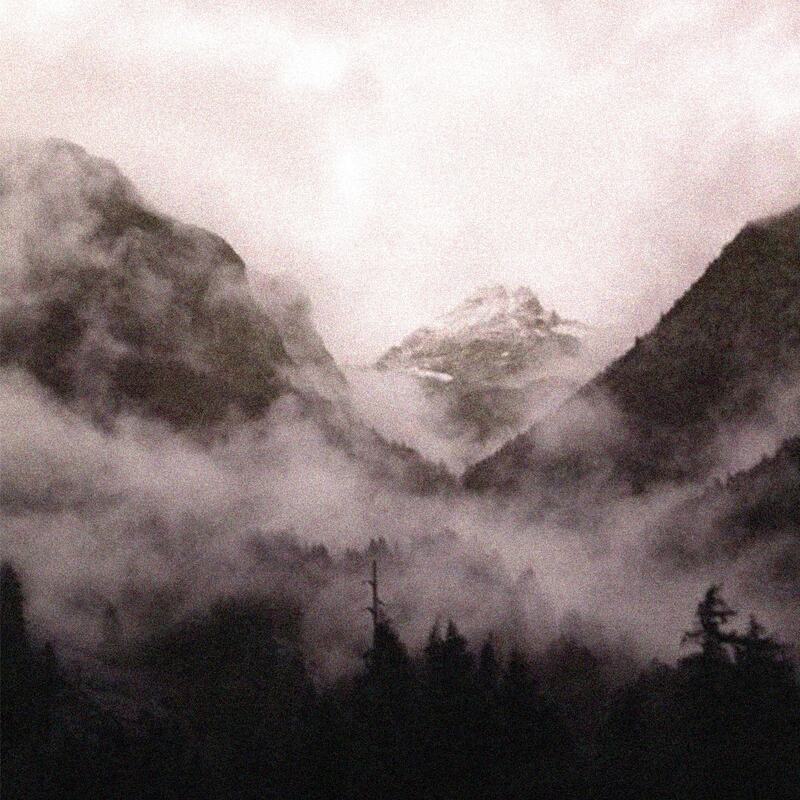 He realized he could have a near-infinite palette of sounds, and create very evocative atmospheres and sinister sounds. At 18, Tejeida moved to London, England to study at London College of Creative Media, receiving an in-depth training in contemporary music, ranging from blues to jazz. The jazz mentality was something that immediately “clicked”. He went on to study sound design, audio engineering, and electronic music production at Point Blank Music School. I would say that Haken makes music for the curious and the easily bored. The music we create has constant changes and unexpected turns. One of the unwritten laws of progressive rock/metal is to never let the mind of the listener wander—quite the opposite. We tend to play hide and seek with the listener’s expectations without losing musicality, constantly challenging the listener to follow a warped path and to give the music a chance, perhaps more than once, until the opus finally “clicks” or “speaks” to the listener’s ears. Over its decade-long incarnation, Haken’s style has been varied and evolving. With rock and metal as a core element, their music also touches on classical music, retro 80s nostalgia, ambient music, EDM, and jazz. If you want to insert a drum and bass section followed by a Gregorian chant followed by a jazz interlude, no one is going to complain. If anything, this would be encouraged. For Tejeida, the word “progressive” isn’t just a label, it’s an instruction that interprets literally in his work as a composer, player, sound designer, and arranger. 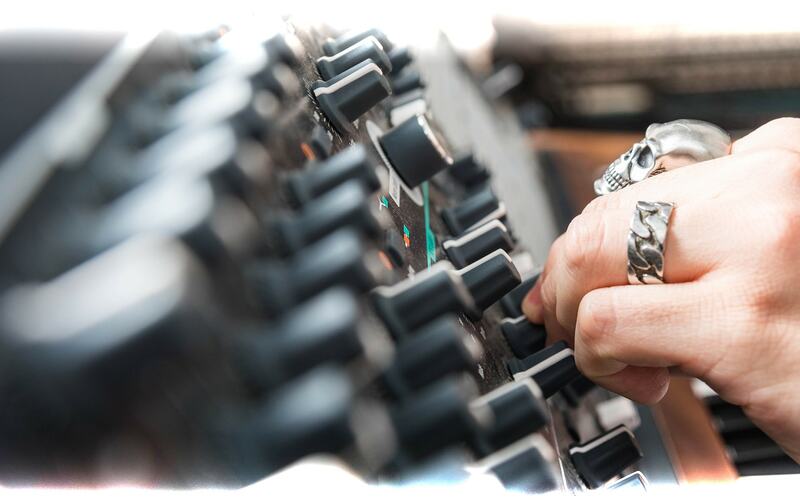 Back in the 60s, the whole idea of the “progressive” genre was to push all the possible boundaries of every aspect in the music: making use of all the new technologies (synthesizers, multitrack recordings, guitar technologies, etc. ), pushing the boundaries of all aspects of the music (arrangement, harmony, rhythm, melody, etc. ), and capitalizing on longer songs with varied and complex structures that completely dichotomized the expected “Intro-Verse-Chorus-End” formula or the common 4/4 meter that had become standard in popular music. 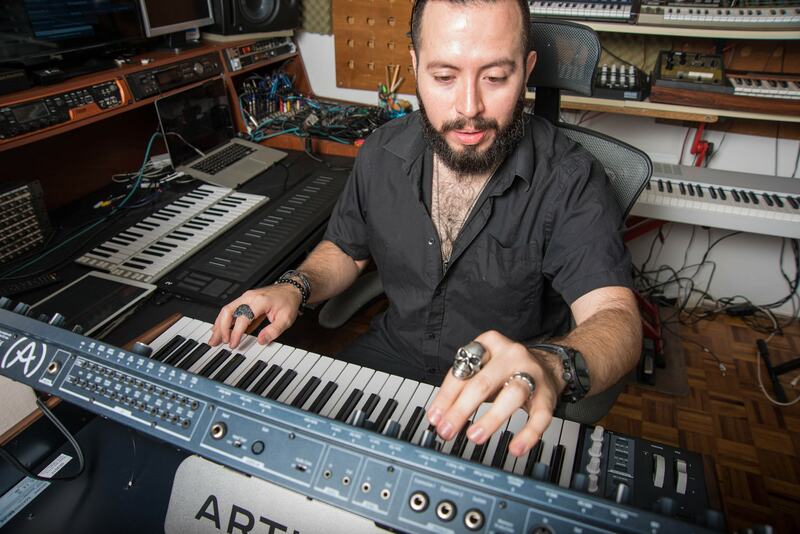 While his skill as a keyboard player goes unquestioned, Diego knows too well that preconceptions of “prog” music tend to be complexity and theory for the sake of it, and takes care not to forego the hooks and catchy elements that get songs stuck in your head and keep people coming back. As with everything you do in life, it is crucial to understand the language until it becomes second nature. A chef, for example, has to learn the taste and flavor of all his spices and all his ingredients until those become second nature. Over time, he develops a refined culinary sensibility to be able know “it needs cardamom” or “a little sherry vinegar” when trying a dish, a detail that for most untrained palates would go unnoticed. In reality, the value of his work resides in his creative mind. The technical knowledge is just a tool to translate the creative mind into the real world. Diego knows all too well how moving and important music can be outside of the creative process. When a fan got in touch to share that a song that Tejeida penned had been crucial for him during the process of dealing with his mother’s death, it had a profound effect. Being able to touch someone’s heart without even knowing them is probably the best retribution you can have as an artist. One of the unique advantages you have as a keyboard player over other instrumentalists is that you can create your own unique sounds with literally infinite possibilities! Guitar players, for instance, are obsessed with their tone, and it really is a proper science getting the right guitar with the right wood, the right pickups through the right pedals, and the right amp and cab. However, their initial “waveform” (talking in synthesis terms) is always going to be the same: an oscillating steel string. Not to mention the limitations of the range of notes available, the lack of total control over the amplitude, its harmonics, etc. 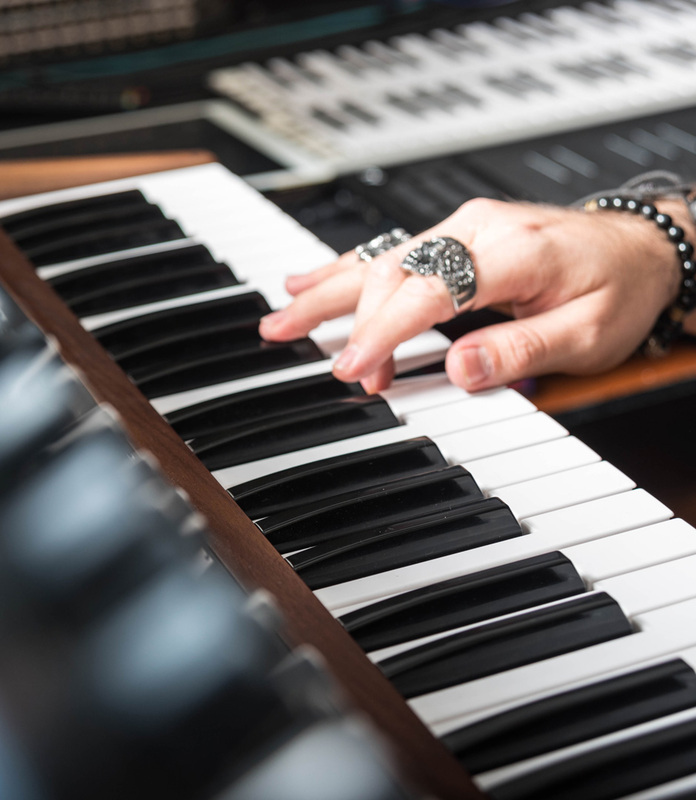 As a keyboard player, you have access to all the elements of a sound: its amplitude, pitch, timbre, etc., and absolute freedom of what “waveform” to use, the harmonics you add, the behavior of the sound over time, etc. 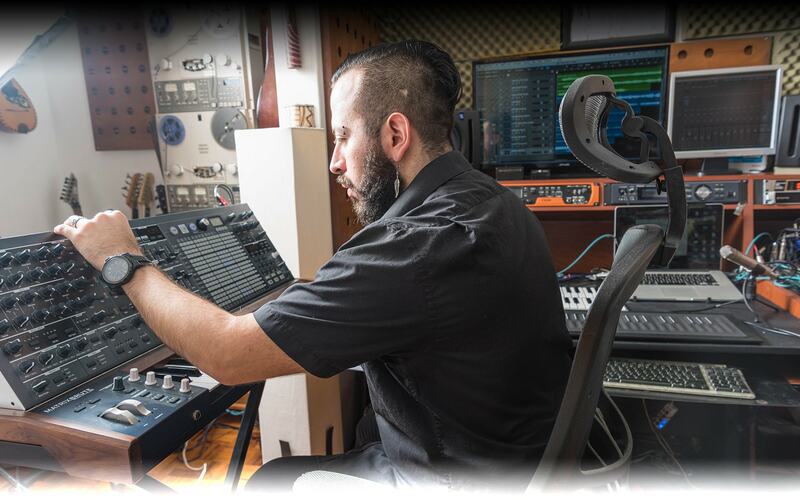 Over the last decade, harnessing this power became Diego’s quest; making a conscious decision to never use presets, and always program his own sounds, aiming to get a unique sound as a player not only musically, but sonically. 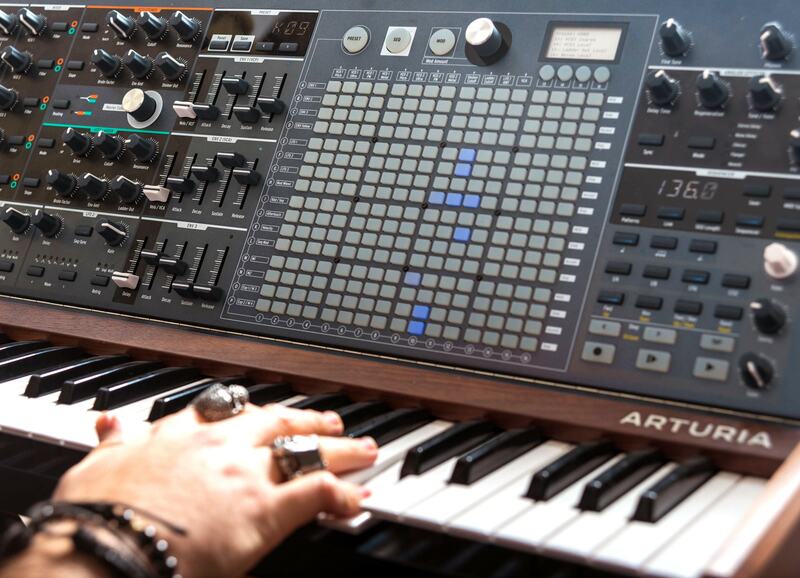 To expand his synth horizons, he became the proud owner of an Arturia MatrixBrute. It really is a very satisfying instrument to look at, from the knobs, sliders, LEDs, the ModMatrix. The whole design is so elegant and aesthetic. As I’ve become more familiar with the MatrixBrute, it has become my favorite tool! When I was a student, I was - like most students - poor, so I had to get all my knowledge about sound design and synthesis “in the box” using plugins or emulations. Eventually, I started buying digital synthesizers, but for me, it still wasn’t the real thing. Digital synthesizers are too “perfect,” and oftentimes you have to fight them to get a sound with “character.” Nonetheless, through the use of software and digital synths, I got comfortable with programming and synthesis. By comparison, playing and programming the MatrixBrute is such an overwhelming joy! There’s something so beautiful and magical about making sounds that are being produced by voltage and analog components, rather than working with mathematically perfect sounds being reproduced by an algorithm in a motherboard’s chip. 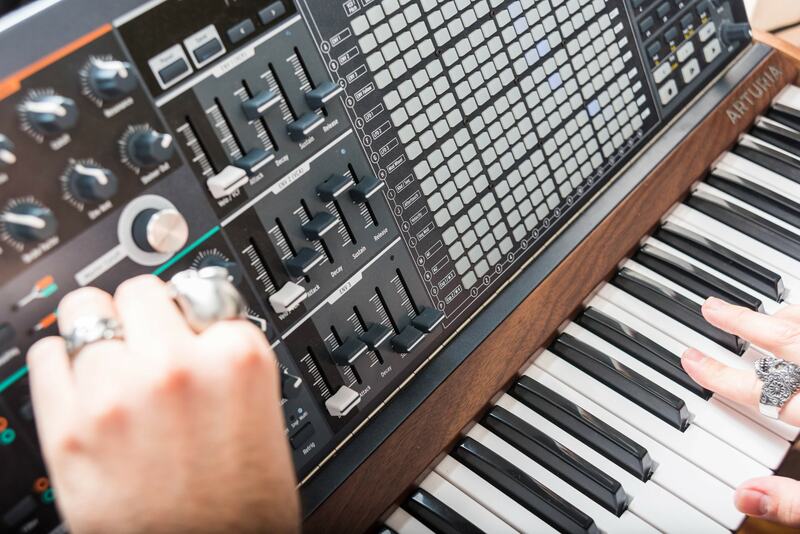 While MatrixBrute opens up vast possibilities for analog synthesis, it combines the best of both worlds letting users save their own sounds as presets for quick recall later, as well as 4 assignable “macro” knobs that let you control multiple parameters at once by turning just one knob. 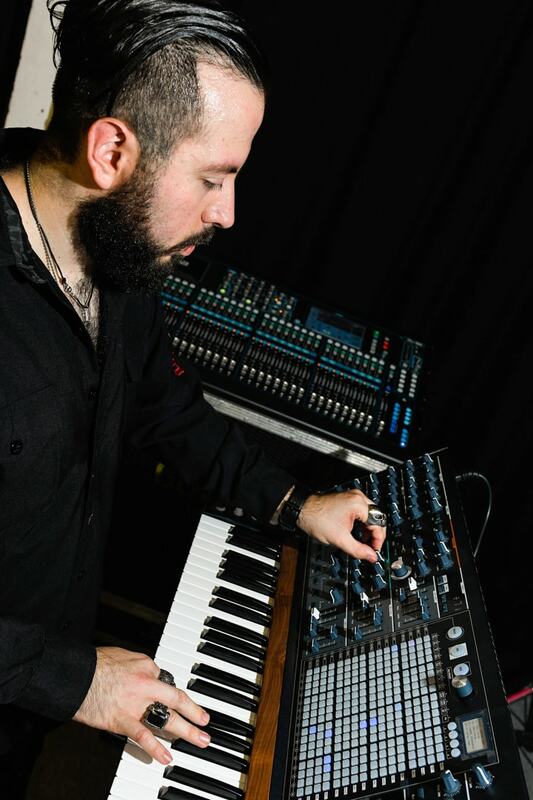 For Diego, the MatrixBrute was exactly what he was looking for. For this album, I made the conscious decision to not use any orchestral sounds, and instead have a much more gritty and raw analog sound. 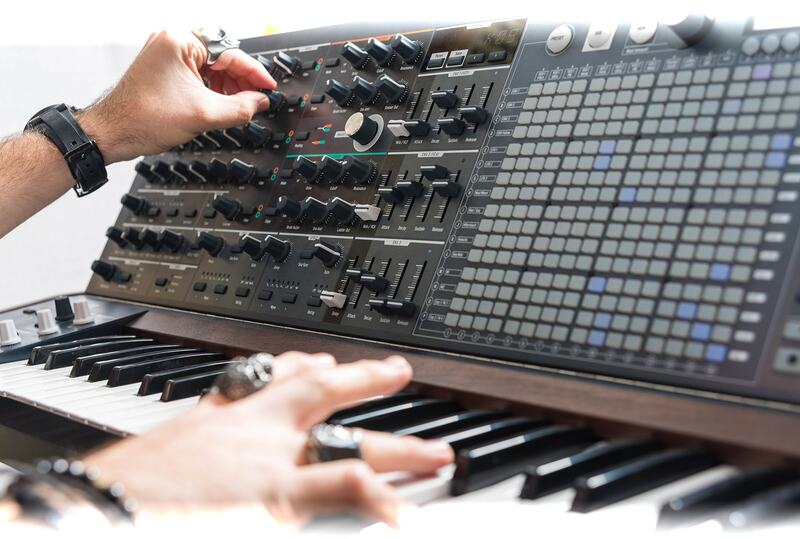 The MatrixBrute was the tool to create all those sounds. It’s a very versatile machine, able to create a soft warm pad with its paraphonic mode, or a very aggressive lead with loads and loads of modulations. 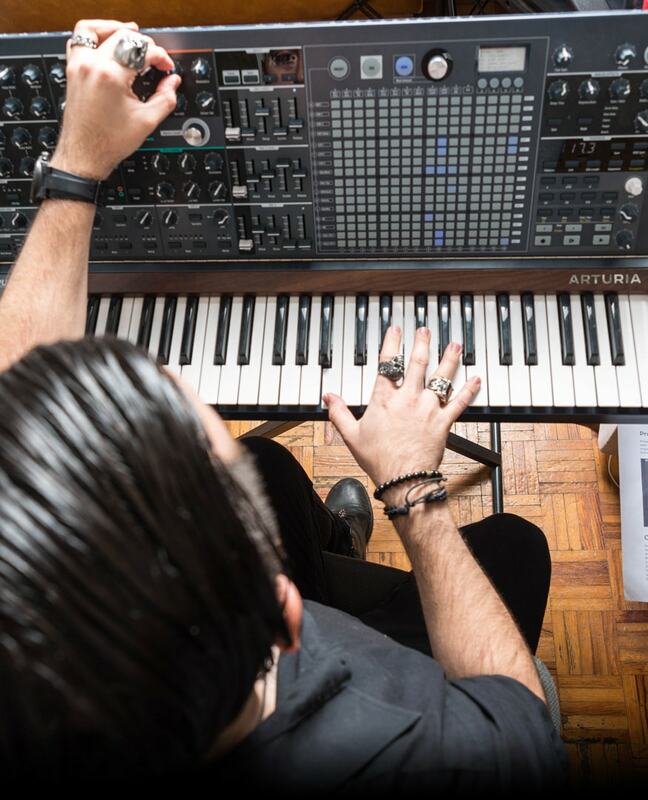 The Arturia team had already spotted that Diego used an Arturia KeyLab 88 MIDI controller on stage and in the studio, but we really got excited when Haken’s synth mastermind took delivery of a MatrixBrute to work on their upcoming album. We jumped at the chance to ask Tejeida to develop a personalized “signature” set of preset sounds that other MatrixBrute owners around the world could use and enjoy. The signature sound bank that I’ve created for the MatrixBrute is the first time that I’ve released any of my sounds, which is a great ambition and honor for me. I always take special care when programming my patches, making sure the sound has character and depth. I also love to add movement to my sounds as part of the expression, having various modulations ready to add throughout a passage. The whole process can be very time consuming, and I sometimes spend 2–3 hours on just one patch until I feel I’m hitting the spot. 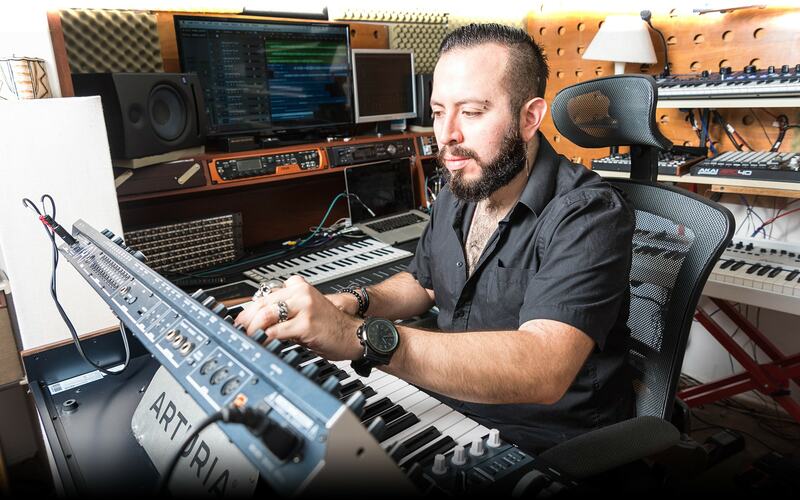 Diego created the patches for his signature sound pack at the same time as he was working on Haken’s new album. Many of these sounds made it onto the album itself, while others were developed for future use, live performance, or just for the sheer fun of playing with them. Haken’s fifth album “Vector” will be available on 26th October 2018, and is highly anticipated in the prog-metal scene. Created with the clear aim of creating a darker, heavier album than their previous releases, Tejeida and the rest of the band have developed a more raw, gritty, analog sound. In terms of the evolution of Haken as a band, the collaborative style of writing is something that I truly love. That has been the band’s way of working for the last couple of releases. No matter how good of a writer one thinks he is, getting someone else involved with a fresh pair of ears and a different approach will always enhance the opus you’re working on. In working this way, you tend to realize not only what your strengths and weaknesses are, but, most importantly, what your teammates’ strengths and weaknesses are. For instance, I know that if I’m working on a heavy riff, I would send it to Charlie, or if I’m writing a crunchy guitar line, Richard would be the one to contact. In terms of specific challenges I would like to take up in the future, I would like to experiment more as an electronic musician. Being a big fan of artists such as Boards of Canada, Brian Eno, Aphex Twin, Infected Mushroom, etc. I would love to work on an ambient/downtempo, minimalist, or experimental record. The inescapable starting point for creating and playing progressive rock and metal is learning the language. Learn your scales. Learn your theory. Learn synthesis and sound design. However, as I mentioned before, I do think this is only the starting point. One valuable piece of advice is to emulate before creating. Understanding and analyzing what makes certain tracks or artists so special will give you some very valuable tools and tricks for the future, especially if the artist you’re analyzing is completely unrelated to the genre you want to work with. Eventually, you’ll start producing your own sound with your own personal flavors and spices. on their extensive North American 2018 tour this winter.